Come May 21, Resident Evil Revelations hits the Xbox 360, PlayStation 3 and Wii U, and Capcom has a long list of reasons why you should care about this rehashed 3DS title. When Resident Evil Revelations debuted on the 3DS on February 7, 2012, fans greeted it as a surprisingly solid entry in Capcom's flagship survival-horror franchise -- particularly for a handheld game. A few months went by, most forgot about the game, and we all collectively assumed that was the last we'd hear of Revelations. Then, recently, Capcom decided that its coffers were looking a bit anemic, and decided that the best way to rectify this situation would be to re-release Revelations on the popular home console du jour. 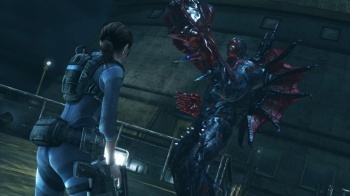 As a result, May 21 will see the PlayStation 3, Xbox 360 and Wii U debut of Resident Evil Revelations. Those of you who played the handheld game, despite your affection for that title, are likely scratching your heads at this news, wondering why you might possibly care about a game you already played through more than a year ago. I was wondering the same thing when the announcement came through the wire. To this, Capcom claims there are many reasons for us to care, and this morning it released a lengthy list of such reasons. The most obvious change inspired by the leap to modern consoles is the improved graphics found in Resident Evil Revelations. The original 3DS game was certainly quite attractive (and one of the few titles not developed by Nintendo that used the handheld's 3D technology in an interesting, engaging fashion) but it was created for the 3DS' relatively low-resolution screen. The Xbox 360, PlayStation 3 and Wii U incarnation of the game will instead feature true HD graphics (though it should be pointed out that, in all likelihood, Revelations will still use the same textures found in the 3DS game). As far as new features, Revelations' biggest boon is the inclusion of a new playable character, Rachel. She made her debut in the 3DS version of Revelations, but in that game she served as a simple non-player character. For the new version, players can assume the role of Rachel, though she's only playable in the game's action-focused "Raid Mode," much like Hunk was in the 3DS title. Further, the new iteration of Revelations will include two additional enemies: The Wall Blister and the as-yet-unnamed hulking behemoth seen in the screenshot embedded at the top of this post. The Miiverse feature will offer Wii U players further exclusives. Players can post a dying message on the Game Over screen for other players around the world to see. The 'Creatures Voice' function allows players to personalize the thoughts of enemies in Raid Mode to taunt their friends. Is this enough to convince those of you who owned the original 3DS game to buy Revelations again on your home console of choice? Personally, I'm unimpressed by what Capcom is doing here, particularly after Resident Evil 6, but the series has long boasted an incredibly devoted fanbase, and if people were willing to shell out cash for what is widely considered the worst entry in the franchise to date, then why not do the same for Revelations? Even without any additions, the core gameplay found in the 3DS game far surpasses that seen in Resident Evil 6.